GUEST ARTICLE: ‘Time for None of the Above’ by Chris Ogden, lecturer in International Relations at the University of St Andrews. To foster accountability and restore our right to dissent, we need another option on the ballot paper. 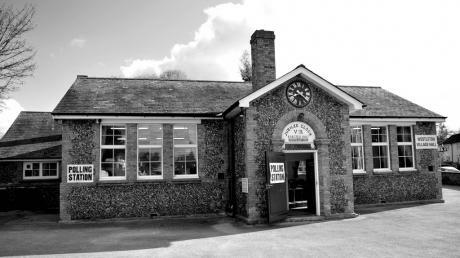 A polling station in Suffolk – don’t all rush at once. As Scotland’s recent Independence Referendum showed, a large proportion of the population can be successfully engaged in, and passionate about politics. Yet whilst the number of political parties offering their services appears to be significantly expanding – along with the scope of electorate choice – the fundamental option to reject all possible candidates in an accountable manner, remains absent. Such a re-buffal – for reasons such as uncertainty, dissent or apathy – is currently tied to a more fundamental rejection; that of our right as citizens to legitimately take part in fair and free elections, in which each of our voices, no matter the persuasion, carry equal weight and importance. Our present participation is limited. Saying “no”, “don’t know” or “don’t care” are essentially illegitimate choices in Britain’s current election procedures. They are also viewpoints that – when held – systematically disenfranchise large segments of our population. Instead of respecting all opinions, our system demands conformity to historically dominant and simplified groupings. This inherently limits electoral choice and shuts off possibilities for progress, evolution and improvement. It also results in a loaded and skewed response by voters to the limited options available, whilst diminishing the value of the dissenting public’s voice. Far from celebrating diversity and complexity, our system seeks to streamline debate, limit our participation in it and rests upon the population’s tacit acquiescence to Britain’s prevailing political consensus. As Susan Harrison noted on openDemocracy some years ago, what is so illegitimate about a voter who would “like to register the fact that I have taken the trouble to vote, have thought about things, and yet (found that) there isn’t really anybody whose opinions represent mine”? Simply not agreeing with those in power, or with those putting themselves forward for political office, should not be considered invalid. At the very least, “not being able to agree” ought to be acknowledged, accurately recorded and taken as a barometer on the legitimacy of a political class that ostensibly represents the whole population. Presently, voters are only left with the ability to spoil their ballot, which provides no measure of actual voter discontent and can be dismissed by political elites as an act carried out in error or misunderstanding. The inclusion of an official “None of the Above” (NOTA) option on all ballot papers can help restore our right to contribute, our right to be heard and our right to dissent. Such efforts will re-invigorate Britain’s democratic tradition, and promote elements central to it, including heightening electoral participation, inclusion and accountability. It will also help to increase the people’s power to press for change through the ballot box, bolster our ability to demand better quality politicians – as Democrat contenders recently experienced in Nevada when they were all rejected in favour of a ‘None of These Candidates’ option – and boost electoral turnout, the decline of which is an engrained negative dimension of politics in modern Britain. As Graham Allen MP has noted, “turnout for the last general election was only 65% – almost 16 million voters chose not to participate – and millions of people are not even registered to vote … this is not an acceptable state of affairs for a modern democracy”. The percentage of those voting has fallen dramatically since 1950, when voter turnout across the UK was 84%, and the country enjoyed a high level of political participation and involvement. Now, when 65% of an electorate votes, a party only needs 33% of the electorate to claim a majority and mandate to govern – hardly the hallmark of a healthy democracy. Beyond this equation, current voter apathy has clear electoral advantages for those in power. Rather than needing to get the entire population galvanized behind a set of core political beliefs, the contemporary politician secures victory by targeting a small number of swing voters identified via focus groups. Low voter turnout makes the number of these critical voters even smaller. NOTA would act as a significant performance indicator for politicians, whose power rests upon electoral calculation rather than full electoral engagement. For the dedicated MPs who fully represent their constituents (and who are not moonlighting with a second job – a notable contemporary trend), a low NOTA turnout could be a noteworthy validation of their role as a community servant. Importantly, change appears to be afoot for democracy in Britain and its constituent parts. At the beginning of December, the UK Parliament’s Political Constitution and Reform Committee asked the public for their views concerning how to improve electoral engagement. Apart from suggestions to lower the voting age to 16 (which will occur in the 2016 Holyrood elections), electronic voting, compulsory voting and holding elections at weekends, their online survey also asks whether ‘None of the Above’ should be an official option on the ballot paper. Whether you agree, disagree or don’t know, taking part in the survey can be the first step to making all of our democratic voices reheard. And for politicians opposed to having a “None of the Above” option, it is time to stop being afraid of democracy, and to accept your public accountability. Originally published on openDemocracy.net Republished with permission. David Babbs from 38 Degrees appeared before the Parliamentary Committee on Voter Engagement to give evidence from a recent survey of their members. NOTA featured heavily in the responses and so naturally featured heavily in his presentation also. Watch the video here, NOTA comes into its own around 20 mins in.